SMC NETWORKS D3CM1604-000. "'DO NOT BUY IT BEFORE YOU MAKE THAT CALL"'. MAC ADRESS & SERIAL NUMBER on the Pictures. 10 x SMC8014WG. 10 x Ethernet patch Cables. Lot of Cable Modems. However, you should note that the actual rate provided by specific service providers may vary dramatically from these upper limits. 10 x Power Supplies. New in box. Box was opened. CABLE MODEM FEATURES. • Cable Interface F type female 75ohm. • Platform independent – works with PC or Mac. • Power, Diag, Cable, Traffic, Wireless, USB, Ethernet. • Supports 16 Service Identifiers (SIDs) in downstream Wireless. Sold as pictured with shown accessories included. SMCD3GN4 Product Condition SMC Manufacturer SMC Item Condition Unit does not include an AC adapter. Item(s) will have a 4"x2" internal inventory label, see pictures. Part Number - 752.9693NA. Manufacturer Part Number. The Gateway is DOCSIS 2.0 compliant to ensure interoperability with existing cable systems. We are unable to provide any assistance with issues relating to your cable operator not accepting these modems. 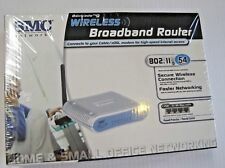 Lot of X5 Brand new SMC 8014WG-COX - Cable modem - Ships today with warranty!! Used only less than two years, all in good working condition and with power supplies. • 10 x Cat5e patch cord. • Backup battery NOT included. • 10 x Power Cord. D3G0804W Manufacturer Part Number SMC Networks Manufacturer SMC Networks Item Condition Unit does not include an AC adapter. Item(s) will have a 4"x2" internal inventory label, see pictures. Unit is untested. 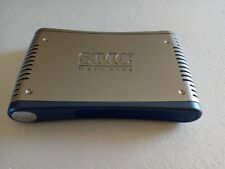 SMC Networks Manufacturer SMC Networks Item Condition Unit does not include an AC adapter. Item(s) will have a 4"x2" internal inventory label, see pictures. 752.9464NA Product Condition Part Number - 1502300014N0. New and sealed condition. You get this exact item so please review pictures for condition. Ready to ship!. Comcast SMC SMCD3G Cable Modem. Was powered up to test -- it turned on and was factory reset to original settings. Note that this was NOT tested to work with a Comcast signal, and you may need a Comcast tech to fully set this up. SMCD3GNV5M Manufacturer Part Number SMC Networks Manufacturer SMC Networks Item Condition Unit does not include a power cord. Item(s) will have a 4"x2" internal inventory label, see pictures. Weight (lbs): 6.00. SMC8014WN Product Condition SMC Networks Manufacturer SMC Networks Item Condition Unit does not include an AC adapter or wireless antenna. Item(s) will have a 4"x2" internal inventory label, see pictures. 7.2V 2.5Ahr(18Wh). Genuine Original SMC FOXLINK BATTERY. 1Yr warranty ! SMC Networks Manufacturer SMC Networks Item Condition Item(s) will have a 4"x2" internal inventory label, see pictures. Part Number - 1502300008N0. SMCD3GN-RES Manufacturer Part Number Weight (lbs): 4.00. SMC8014 Product Condition SMC Manufacturer SMC Item Condition Manufacturer Part Number Unit does not include an AC adapter. Item(s) will have a 4"x2" internal inventory label, see pictures. Weight (lbs): 3.00. SMC Networks SMC8014-BIZ(RoHS). Included in each Box: Modem, CD ROM, Ethernet Cable, Data Cable, and Power Adapter. SMC Networks presents the premier D3CM1604 16x4 channel bonding DOCSIS 3.0 Cable Modem. It features a 10/100/1000Base-T Ethernet (RJ-45) port, easy-to-read status LED and is easy to install. Does NOT have wireless functionality. DOCSIS 3.0. -16 downstream channels. Manufacturer SMC Networks. -1 x Cable COAX port. -Cable modem. -Three (3) AC Power cords. -Three (3) Ethernet cables. -2 x Phone port. Is listed pre-owned but shows no signs of usage open box to test power on. We do our best to process as quickly as possible. We promise to do our very best to try to make you happy! Unless stated otherwise. Manufacturer -SMC Networks. -Cable Modem. Model Number -D3CM1604V-400. -Multiple Ports: LAN, Phone, Cable/COAX. Local pick-up is available. Part Number -752.9894NA-NCS. Location -D432 #J846. Powers On. 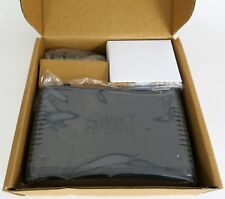 Unit is one SMC Networks SMC8014W-G Modem that is listed as Used in good condition. We are unable to provide any assistance with issues relating to your cable operator not accepting these modems. And high-speed gaming. It features a 10/100/1000Base-T Ethernet (RJ-45) port, easy-to-read status LED and is easy to install. Does NOT have wireless functionality. Does NOT support VOIP/phone lines or services. Buying your own modem can provide continuity and flexibility to design and control your home network. Whether you're building a network for the first time or looking to upgrade from an older model, SMC units are a reliable option. Depending on your network and your needs, you can find the right modem for you. How do you choose a modem? SMC makes several different models for your home or business LAN. Here are some key factors to keep in mind. Service Provider: Before purchasing, check with your service provider to make sure that SMC products are compatible. SMC is a licensed provider for most nationwide internet service providers, but be sure to check ahead. Bandwidth Speed: The next feature to look at is bandwidth because SMC offers options in this category. Especially if you're paying for high-speed Internet access, you want to be sure that you have hardware capable of handling the data. Always look at both the upload and download speeds. These speeds should be as high as your plan limits. Number and Type of Devices: Finally, because most SMC products come with wireless routers built in, always look at the number and type of connections. If you have wireless devices, make sure that wireless is included. If you have wired connections, make sure that the SMC hardware has enough ports. Do you need a modem, router, and switch? The terms are sometimes used interchangeably, but these hardware types actually do different things. Modems take the signal from an outside source, such as your internet service providers line, and the modem connects your home system to that source, and switches send information from your router to your end-user devices. Routers and wireless routers distribute signals to the different devices in your home. Most SMC models also act as wireless routers with the added benefit that they allow you to connect directly to a standard high-speed line. Additional physical or wireless routers can increase your network size, but the base speed will still depend on your internet provider and the capacity of the gateway device. A gateway is basically the same as a modem, except that gateways have routers built in. The term gateway refers to the fact that this hardware acts as a gatekeeper between the outside world and your home network. SMC modems, with built-in routers, solve the problem of having to install and configure one more item.